Cheesy Cauliflower Bacon Gratin is a low carb, fail-proof dish that will surely please a crowd. It is baked in a cheesy cream sauce smothered in grated cheddar and fresh parsley garnish. Heat oven to 400 degrees. 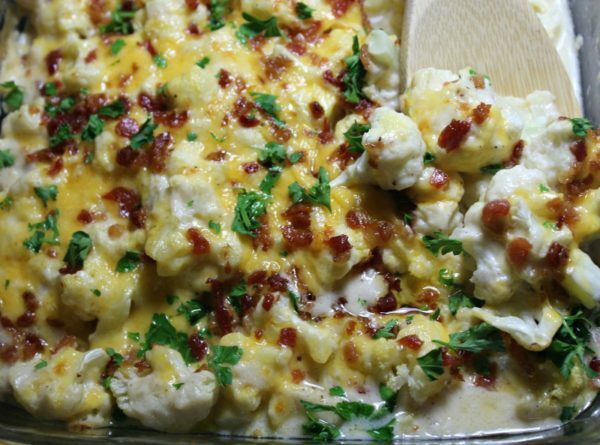 In a 9×9 lightly greased baking dish, add cauliflower florets. Set aside. In a large mixing bowl, whisk together cream of chicken soup, water, heavy cream and salt and pepper. Pour over cauliflower. Remove foil, top with grated cheddar cheese and bacon pieces. Continue baking, uncovered, for additional 5 minutes or until cheese is golden brown. Top with fresh parsley, sliced green onions or chives. Enjoy!